Alcatel has announced its new OneTouch Hero 2, a flagship device with some pretty solid specs at IFA and it looks to be something to watch. 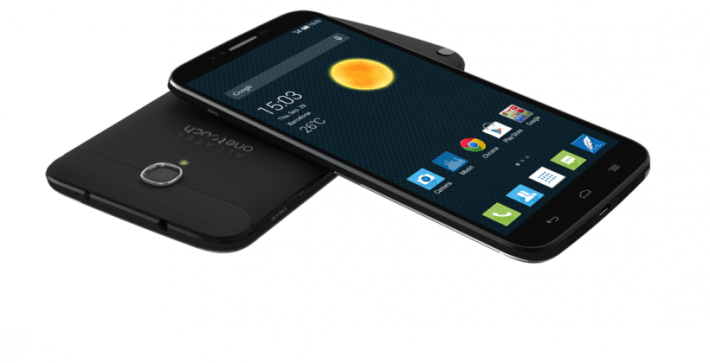 The OneTouch Hero 2 is powered by a MediaTek MT6592 octa-core CPU with 2GB RAM. There’s also a massive 6-inch 1080p display, and other specs include a 13.1MP rear cam, 5MP front cam, 16GB storage, aluminum body, microSD, 802.11n Wi-Fi, 4G LTE support, a 3100 mAh battery and Android 4.4 KitKat. There’s also a stylus that makes this is note competitor of sorts, though obviously Alcatel’s digital pen likely can’t begin to compete with the advanced functionality of the S-Pen. Alcatel haven’t released pricing information for the Hero 2, however they are usually fairly budget conscious when it comes to pricing. They have noted the Hero 2 is due arrive to select markets sometime this month. Motorola are showing off their new Moto X in Chicago whilst everyone parties in Berlin. Engadget sneaked off to cover it whilst Sony and Samsung wowed all else. This incarnation still sports a 5.2-inch AMOLED display, still has Corning Gorilla Glass, however it is roughly half an inch wider than the last X. Updated for this year is a 1080p full HD display instead of a 720p one, the screen takes up almost the entirety of the phone’s face, with minimal bezel on the bottom and the top. This phone is now a good bit bigger, measuring 72.4mm wide by 140.8mm tall and it weighs about 144 grams. The Moto X retains the curved back from the original, however it is slightly slimmer — arching from 3.8mm at its thinnest to 9.9mm. An updated 13-megapixel camera features 4x zoom and an all new ring flash. This will allow capture of 4K video instead of just 1080p. A Qualcomm Snapdragon 801 processor rules with a 2.5GHz quad-core CPU, an Adreno 330 578MHz GPU and 2GB of RAM keeping things moving. 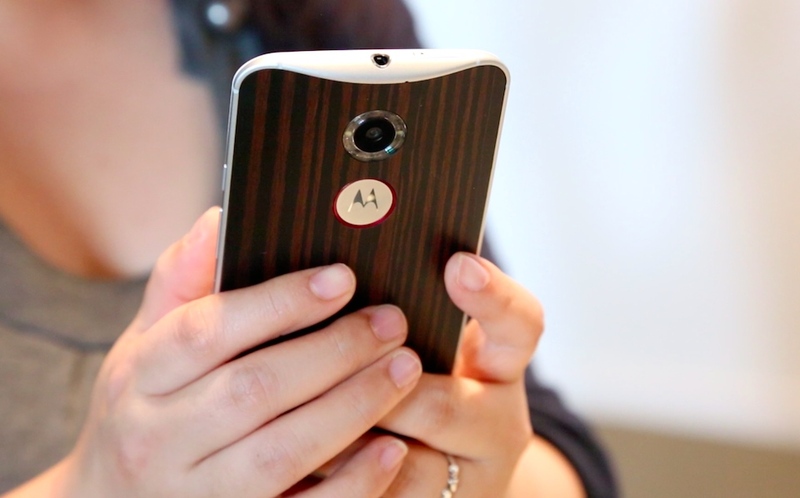 Powered by a 2,300 mAh battery Motorola are confident this will keep you going all day. Storage sees both 16GB and 32GB iterations, yet no mention of expandable storage. Best of all, stock Android! Motorola have pre installed a few services however not in the way of the UI. In saying the, there are a couple of stock changes, “Ok Google” has been changed to “Ok Moto X,” this inself is a little annoying so Motorola have had a little fun here and added “Wake up sleepyhead,” and “Hello Jarvis.” Nice little addition. Other voice commands include “Take a selfie” activating the front-facing camera along with a countdown timer so you never have to press a button. “Good morning” to shut off Sleep Mode and tell you about your first appointment, “What’s Up” to inform you of the time and the latest notifications, plus “Navigate” followed by the name of a destination. You can also say “Play YouTube” to launch YouTube and “Post to Facebook” to update your Facebook status. Picture quality performance which perfectly matches the environment in which it is being viewed. Reproducing deep, rich blacks, whilst also retaining rich colours in dark scenes has been a long standing weakness of LCD TVs. In order to deliver best-in-class black performance, the AX900 uses a Direct LED with full-array local dimming complemented with Panasonic-unique Local Dimming Ultra technologies. Other full array local dimming systems suffer from a ‘halo’ effect around moving bright objects because their local dimming fields lack sufficient brightness control or are either entirely on or off. The AX900 analyses the incoming video signal not in traditional 3 x 3 matrices, but across 5 x 5 matrices of local dimming fields and adjusts the brightness level of each individual field by extremely fine degrees (i.e. not just on/off), providing smooth motion of bright objects, a high contrast ratio, deep, rich blacks and extremely fine gradation which retains detail even in the darkest scenes. Colour reproduction in dark scenes has been another weakness of LCD TVs. In order to allow viewers to enjoy films as the directors intended, the AX900 engineers have also worked together closely with the renowned Panasonic Hollywood Laboratories to ensure that the colours on the AX900 are exactly the same as the director intended. To achieve this Panasonic has adopted colour management technologies which have until now have only been used to the same degree by professional studio monitors, such as our professional-standard 3D Look Up Tables with 8000 registry points which allow us to calibrate colour reproduction at extremely fine brightness steps meaning that colour is reproduced accurately at any brightness level. 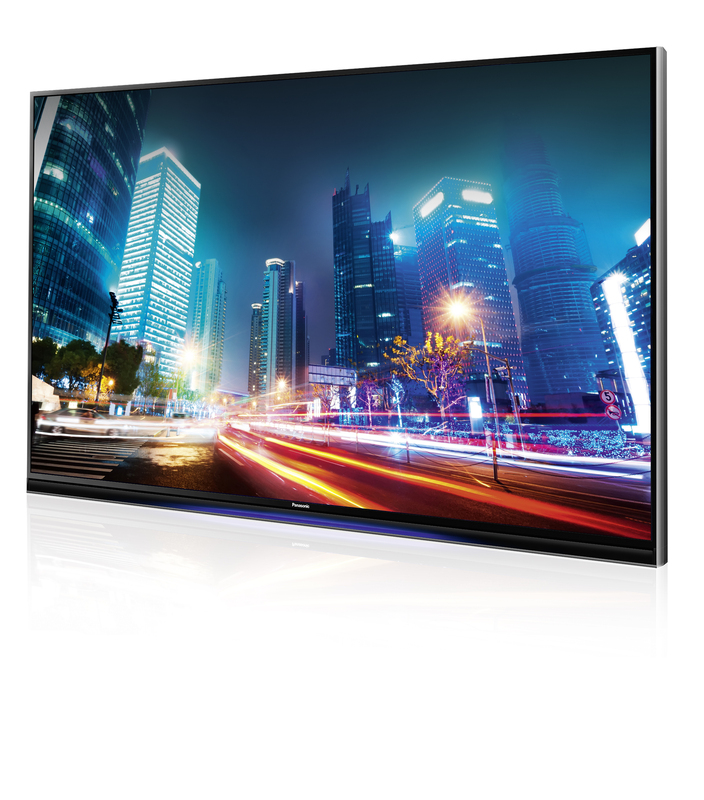 Panasonic is the first company to use this professional technology at the same level in a consumer television. Furthermore the use of a highly transparent LCD panelalso produces outstanding brightness and allows the AX900 to achieve an extremely high dynamic range, with richer more nuanced colours in both dark and bright scenes. Furthermore to deliver the very best picture performance it is also necessary to analyse the lighting conditions in the room in which the TV is placed. Accordingly, in another industry first, the AX900 explicitly links its video signal processing to ambient light levels in order to deliver picture quality which is a perfect match for your living room. The combination of the above Panasonic original picture quality technologies lead to significant picture quality performance improvements in a LED LCD TV. The AX900 is Panasonic’s first TV to employ our quad-core Pro5 super-high speed processor which further enhances Panasonic’s ‘Beyond Smart’ feature set. The ‘my Stream’ function, which learns users’ preferences and displays a list of content recommendations, has also further evolved. A flowing user interface display and video playback in thumbnail form make it even easier to find desired content. The ‘TV Anywhere’ function allows users to transfer live broadcasts or recorded contents via the cloud to their smartphone or tablet device anywhere in the world. The ‘Info Bar’ quickly and conveniently displays new and useful information without even requiring the user to turn on the TV due to a proximity sensor coupled with Face Recognition. A host of network functions allow full enjoyment of this picture quality performance for a wide spectrum of 4K content. Four 4K60p-supporting HDMI terminals and one DisplayPortTM enable simultaneous connection of a 4K-compatible home cinema, a set-top box, a PC, and more. Future use is assured by the AX900 Series’ ability to play content with HDCP2.2 copyright protection and its H.265 (HEVC) decoder can decode 4K content from a variety of providers. Furthermore Panasonic is working closely with Netflix to enable 4K streaming at launch timing. The AX900 will also be compatible with Amazon’s upcoming selection of movies and TV shows, along with its Amazon Studios original TV series, in Ultra HD quality. The AX900 Series was designed based on the concept of Premium Furniture Design. This cutting-edge design concept removes redundant elements to achieve a simple elegance, and glass and metal materials provide an authentically luxurious touch. The AX900 Series literally blends into the living space while adding a stylish touch to its surroundings.